Many years ago I was taught a really cool drawing trick that if you’ve a piece of artwork that you can’t figure out why it’s not quite right then just look at a mirror image of it! No really, it totally works and the ‘error’ is so clear! I’ve found another weird situation though where I can finish some artwork but it’s not until I post it on a different platform that I can see the problem! 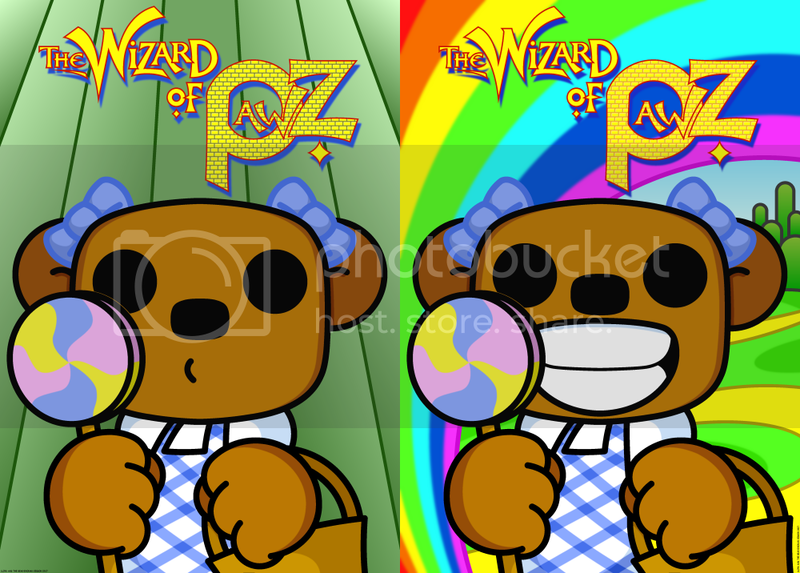 Case in point the Wizard of Pawz print I did at the end of last week. Now sure, I was in a bit of a rush as I had other things on but I figured I was happy with it although it wasn’t until I posted it on Twitter and Facebook that I realised that it was a bit dull! If there’s ever a print that needs to be as retina-burning-bright as possible to match the movie it’s Wizard of Oz! Anyways, I’ve redone the picture and gone all out. It’s bright, it’s loud, and I’m kinda happy of it (well, as happy as I can be as I’m never happy with anything I do. It’s the whole tortured artist thing). So here’s the original and updated versions – what do you think? This new print – along with all our usual gubbins – will be on sale at Cariff Independent Comic Expo on July the 8th! Check out more on our conventions page!